Getting a license is a big deal when it comes to online gambling. Casinos that have licenses have passed myriads of security checks with many different government bodies (including customs and Law and Order branches). They have paid quite substantial amounts of money in addition to providing multiple proofs that their business is safe, see-through, and secure. So what are the most important things you have to bear in mind about Latvian licenses? Plenty of limitations and requirements to be fulfilled. First of all, acquiring a license is only permitted on the territory of the country where the business is legal. Straight away, there is one advantage of doing business with someone with a license (or having it): you know that they and you won’t have any kind of problems with the government. The gambling industry is one of the best ways of making profits (and even multiplying your income if you really know what you’re doing). In the countries of CIS, where the market is relatively new and unexplored, and the government typically hangs on to any type of income and welcomes gambling with open arms, this niche is teeming with opportunities. However, the online gambling market is a cutthroat business, which is extremely volatile, and depends heavily on client inflow. Therefore, reputation is everything. Providing guarantees to the clients is the foundation of every online gambling business. Declaring your business as legal and secure is one of the ways of ensuring your profits go through the roof. Latvia in this sense is the country to be in, because, unlike its next-door neighbors, it allows residents and non-residents alike to register to have fun, which will happen, provided you have all the right papers, within a pretty short amount of time of up to a year. It also lets out get out of double taxation and get a permit for relatively low cost. Enjoy! The procedure is pretty straightforward, just like with everything else. The casino-owner-to-be submits all the documents (we’re not listing them here because that would take an eternity), and wait until an independent body checks the software they have and their reputation and structural integrity of their business. That means there is no suspicious code, and Random Number Generators are, well, random. The owner must make sure they submit evidence of integrity checks, proof of software quality, and a whole plethora of other documents, in the final application. Although some people like involving lawyers in the process, we’re fairly confident you can handle supplying the list of about 50 documents yourself. In case you’re not really comfortable with that, it’s worth involving a suit: The Force will be with you. Good luck, and Godspeed! Oh, and don’t forget to renew your certificate after, bearing in mind that is bound to also take some time. There are 7 licensed casinos in the country (not much for vengeful competition, huh?). In the last two years the revenue from gambling in Latvia grew by over 10 000 000 Euros, so we would say this is a pretty good place to invest in. The official application procedure involves submitting a request to the authorities and paying the 427 000 Euro fee. That sounds like a lot, but it’s worth it, in the end, considering the fact that online gambling today is the official top way of increasing/multiplying revenue. Make sure you include funds for any additional permissions you may have to pay for. And don’t forget to renew the license in time. Have we covered everything? No, we haven’t. 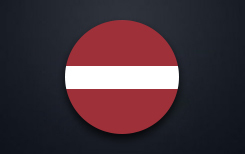 Add to this a somewhat patriotic measure by the authorities: 50% of staff are required to have a Latvian citizenship. Also, make sure you carefully monitor the fact that all your clients are below 18. You may be able to escape the crossfire of double taxation here, but the taxes will come up to around 15%, regardless of the size of the venue and income. Also, you will find certain steps have been taken to ensure that the taxes stay at the same level, on one hand, and that illegal gambling is prosecuted through cutting off access to the websites that practice illegal gambling. And bear in mind those unfortunate ones who have been blocked: their numbers grow as we speak.